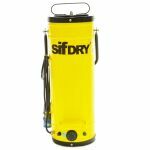 Lightweight, durable and completely portable, easy to load, easy to carry, ready to provide low cost control of welding quality in the workshop or on site. This portable drying oven can help reduce operating costs by providing operators with fast access to electrodes at the point of application. Features a 400watt heater which is thermostatically controlled to warm the rods between 60°C and 300°C. Weighs only 8kg with a rod lifter which can hold up to 18kg electrodes. Operates from 110v Mains Input Supply. Maximum recommended electrode length 350mm.